The kart racing genre is a staple of gaming that each console generation experiences. 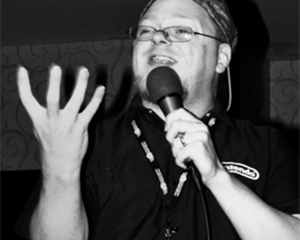 While Mario Kart may have broken the original mold, several hundred others xeroxed it before the concept broke. But like every copy of a copy, it loses quality as each new version is thrust upon the unsuspecting game-buying populace. 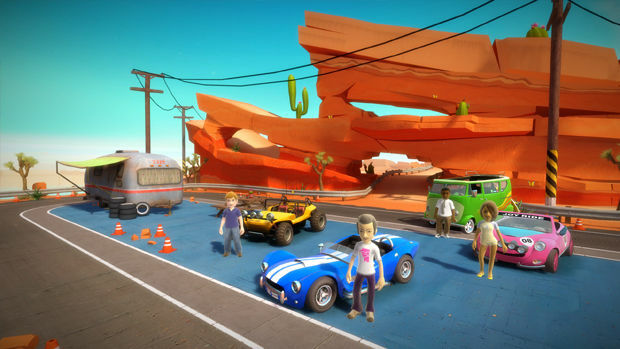 Last year, to usher in the new control of the Kinect, Microsoft Studios showcased a then free-to-play, micro-transaction-funded kart racer, which was eventually scrapped for a retail version called Kinect Joy Ride. Much like those who played it, the game flailed. 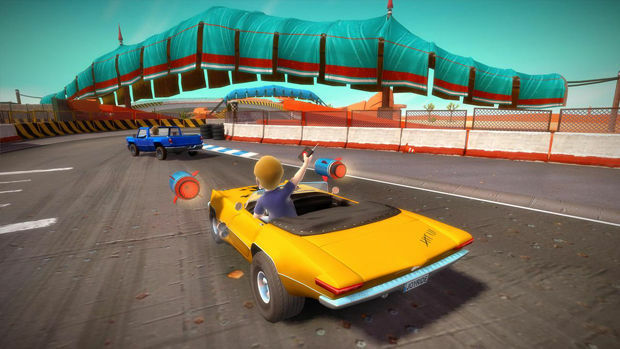 Now, the company has ditched the motion controls and slapped a "sequel" onto Xbox Live Arcade in the form of Joy Ride Turbo. And I played it. 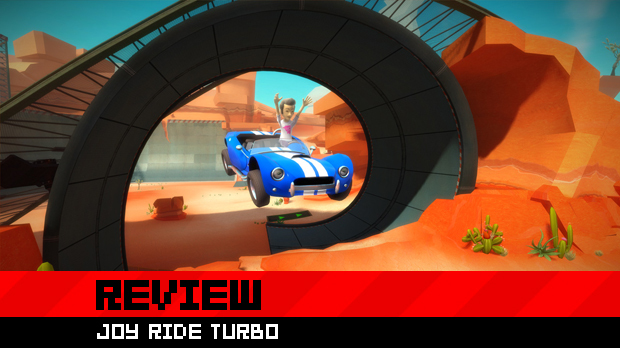 While kart racers can be fun diversions and are often entertaining multiplayer experiences, Joy Ride Turbo is as lackluster as they come. It isn't that it's an incompetent game, rather, it's just not a very fun one. Gameplay is split up into three modes: Championship Series, Stunt Track, and Single Race, with each having further separation of 100, 200, and 300cc classes. These class separations seem to make no noticeable difference in course or race difficultly, other than how much the racer AI rubber bands on the final race. In Championship mode, there is further separation for muscle, truck, and sport car series, with three races for each car. The fourth race set allows the player select any car class and race in the final three-race tournament. As you race, you have your standard set of power-ups that you'll collect from crates along the course. Missiles, dynamite, and gas canisters used to increase boost can all be found. Boost plays a big part here, as drifting or doing tricks off jumps (with the analog sticks) builds up a small meter at the bottom of the screen, and boosting helps you power through the course off ramps and hidden shortcuts. 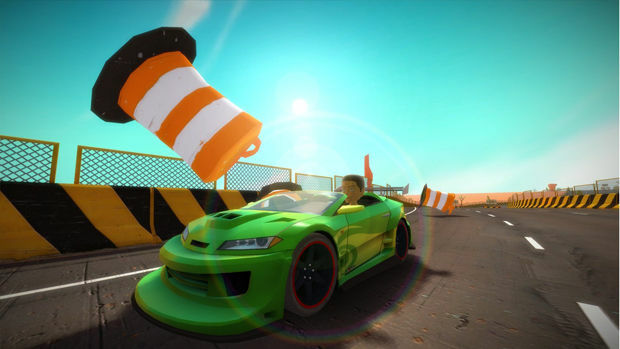 In addition, there are also car-part crates hidden around the tracks which, when gathered, unlock more cars to race with. Sadly, this is the first of many problems with the game. You start with one car of each type already unlocked for races, with four others in each type visible. However, to unlock these, you must gather three different crate types to unlock the car. Then, once unlocked, you must purchase it with coins, earned either from winning races, or gathered along the Stunt Track, which I'll get to later. Further confusing matters, there are also variations on the car types, unlocked in the same manner. What makes this annoying, however, is that even if you gather all the crates from all ten races (a minimum of four in each) you still may not have the right parts to unlock one full car. You've gathered the wheels from one, but not the shocks or engine. You'll have the shocks and engine for another car, but be missing the wheels. I went through each of the ten races in single-race mode and just drove along and gathered up all the crates in each race, and only unlocked six cars (out of the 45 possible). Then there's the races themselves. Despite each having various shortcuts and twists and surprises along the way, there is just an overall blandness to each race. The other drivers are innocuous, inoffensive nobodies who don't really pose much threat, even at the higher race difficulties. Thankfully, there's four-player split screen and eight-player online modes to present an actual challenge, but with only ten courses in total, repetition becomes tiresome and there's not enough variety in the courses to warrant more than a few runs per race. Thankfully, there is the Stunt Track, which is the saving grace of this game. Here, you're allowed to tool around a giant course with ramps and jumps winding through valleys littered with coins. While this mode is also strangely separated into 100, 200 and 300cc classes, the course remains the same and it's not really a "race" even. You're not competing against anyone, just gathering items and exploring. And that may be why it works so well. Unfortunately, even this is short lived, as there are only two stunt courses. The rest of the gameplay is rounded out with the same boring races from championship mode in "battle," "pro," or time-trial single races. I really have no idea what separates battle mode from pro race, as they appear and function exactly the same, but there they are listed as separate features. While Joy Ride Turbo isn't a good game, it's not a bad game, either. It's a competent racer that could have benefited from better race and track design to make the experience a bit more enjoyable. Bland tracks, similar variations on popular power-ups, and no real sense of accomplishment for unlocks makes for a very boring racer indeed, and the lack of development into the game's one truly fun mode is a crime. Perhaps they'll release more stunt courses as DLC, but by the time they do, I'm fairly certain no one will care.